One of the most fun aspects of any engagement is attending and hosting wedding showers! 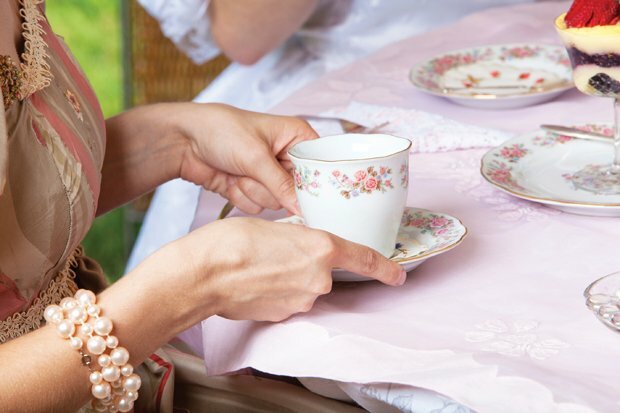 Barrett Baker, a busy bridesmaid on the local wedding circuit, turns to her friend Alivia Weeks’ mother, Pam Bryers, for her favorite tried-and-true bridal shower recipes. “This is basically a dessert that people sip on while sitting around chatting away before we even sit down to eat!” says Barrett Baker. 1. Brew coffee and refrigerate until ready to use. 2. In large punch bowl, add coffee, milk, ice cream, vanilla and sugar. Mix until ice cream is melted but still lumpy. 3. Garnish with whipped topping and chocolate sprinkles, if desired. This scrumptious, savory app is one of Pam Bryers’ favorites to serve up to a crowd. She got the recipe from her friend Lisa Sullivan. 2. In a large bowl, cream together melted butter and cream cheese. Add remaining ingredients. Stir to combine. 3. Transfer to a baking dish. Bake until warm and bubbly. Serve hot with crackers or chips. 1. In a large bowl, mix together sour cream, cream cheese, sugar and vanilla. Add grapes and stir to coat. 2. Store in refrigerator until you are ready to serve. 3. Just before serving sprinkle brown sugar and pecans over top. This sweet finale comes from another friends and seasoned hostess, Michelle Scott. “My mother owned a bakery when I was a child, and this is one of her specialties, ” says the busy mom of four. A true labor of love, these are a beautiful, delectable party treat. 2. In a bowl, cream together sugar, butter and shortening until smooth, then beat in vanilla. Add eggs, one at a time, until the mixture is fluffy. 3. In a separate bowl, sift together the flour, baking powder and salt. Add dry mixture and evaporated milk to the original mixture alternately. Beat for 2 minutes on medium speed, then fold in the sour cream. 4. Cool completely before adding a crumb coating of Buttercream Icing. This is just a thin, smooth layer of icing to keep the crumbs from showing when you glaze the petit fours. 5. Store entire pan in freezer overnight. 6. When ready to begin the glazing process, remove cake from freezer and cut all edges off. Cut remaining cake into 1 – 1 1/2 inch squares. Eyeball it or use a ruler and straight edge to mark. 7. Place back in freezer for around 10 – 20 minutes until very cold again. 9. 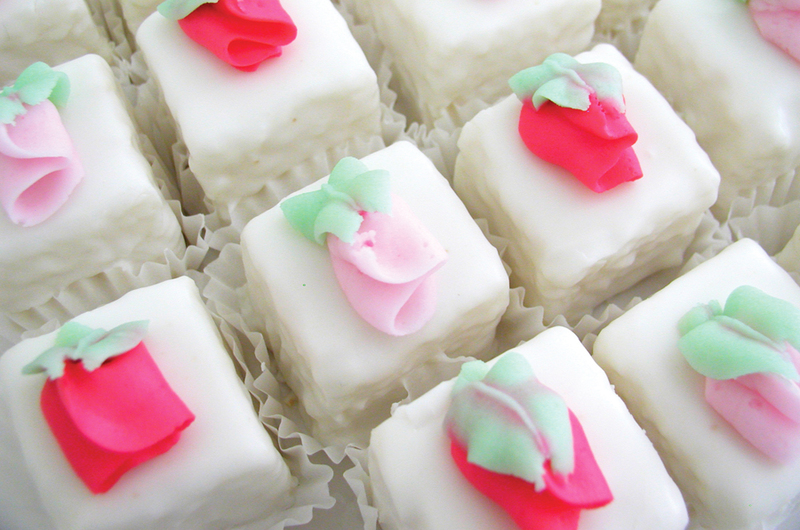 To prepare your work area, place cooling racks over parchment paper to place the glazed petits fours. (This is a messy process!) Keep your glaze over the double boiler as you work, and if it gets too thick, add a bit of skim milk. If too thin, add a bit of powdered sugar as you go. 11. After cooling, place petits fours in miniature baking cups (this serves two purposes, both for presentation and to hide any imperfections in the glazing) and decorate as desired. If you are using edible pearls, or other sprinkle decoration, you may add these while they are still warm. 12. If desired, simple monogram or flower piped with buttercream looks particularly beautiful on top. 1. In the bowl of an electric mixer, cream the butter, shortening and vanilla extract until smooth, about 3 – 5 minutes on medium speed. 2. Add about 1/4 of the confectioners’ sugar. You need to add this gradually. It makes a bit of a mess! 3. Mix on low until incorporated. Scrape the sides of the bowl down with a rubber spatula and add another 1/4 of the confectioners’ sugar. Continue mixing and stopping to scrape the sides of the bowl. Add more confectioners’ sugar until you’ve added it all. This mixture will be thick. 4. Add 1/8 cup of the milk and mix at low speed until incorporated. Add more or less depending on your preferred consistency. 1. Add shortening to milk over double boiler until combined and melted (but do not let it boil). 2. Gradually add a little confectioners’ sugar at a time, mixing with a hand mixer until all combined and smooth. 3. After the majority of the confectioners’ sugar has been added (reserve some in case it’s too thin later), add in the vanilla and almond extracts. The consistency should be pourable but not translucent. Adjust milk and sugar as needed to maintain consistency. Keep over double boiler as you work.